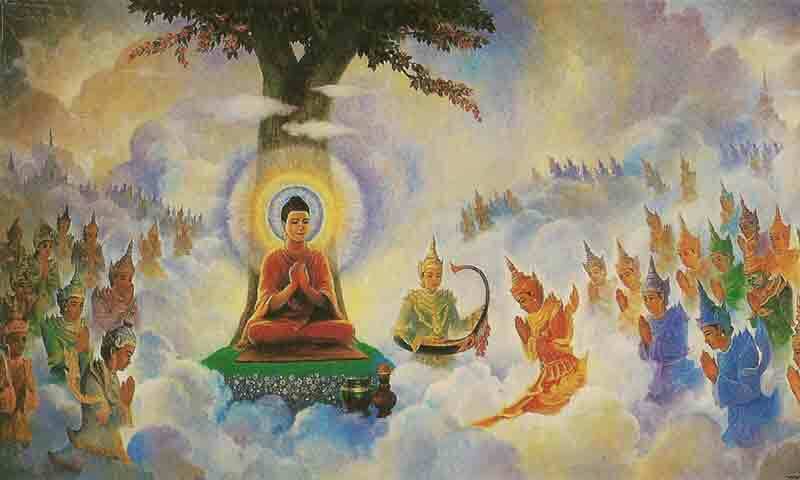 In Buddhist cosmology, the heaven realms are blissful abodes whose present inhabitants (the devas) gained rebirth there through the power of their past meritorious actions. Like all beings still caught in samsara, however, these deities eventually succumb to aging, illness, and death, and must eventually take rebirth in other realms  pleasant or otherwise  according to the quality and strength of their past kamma. The devas are not always especially knowledgeable or spiritually mature  in fact many are quite intoxicated by their sensual indulgences  and none are considered worthy of veneration or worship. Nevertheless, the devas and their happy realms stand as important reminders to us both of the happy benefits that ensue from the performance of skillful and meritorious deeds and, finally, of the ultimate shortcomings of sensuality. how few here see clearly! who make it to heaven. "I have seen beings who  endowed with bodily good conduct, verbal good conduct, & mental good conduct; who did not revile Noble Ones, who held right views and undertook actions under the influence of right views  at the break-up of the body, after death, have re-appeared in the good destination, the heavenly world. It is not from having heard this from other priests & contemplatives that I tell you that I have seen beings who  endowed with bodily good conduct, verbal good conduct, & mental good conduct; who did not revile noble ones, who held right views and undertook actions under the influence of right views  at the break-up of the body, after death, have re-appeared in the good destination, the heavenly world. It is from having known it myself, seen it myself, realized it myself that I tell you that I have seen beings who  endowed with bodily good conduct, verbal good conduct, & mental good conduct; who did not revile noble ones, who held right views and undertook actions under the influence of right views  at the break-up of the body, after death, have re-appeared in the good destination, the heavenly world." "Furthermore, you should recollect the devas: 'There are the devas of the Four Great Kings, the devas of the Thirty-three, the devas of the Hours, the Contented Devas, the devas who delight in creation, the devas who have power over the creations of others, the devas of Brahma's retinue, the devas beyond them. Whatever conviction they were endowed with that  when falling away from this life  they re-arose there, the same sort of conviction is present in me as well. Whatever virtue they were endowed with that  when falling away from this life  they re-arose there, the same sort of virtue is present in me as well. Whatever learning they were endowed with that  when falling away from this life  they re-arose there, the same sort of learning is present in me as well. Whatever generosity they were endowed with that  when falling away from this life  they re-arose there, the same sort of generosity is present in me as well. Whatever discernment they were endowed with that  when falling away from this life  they re-arose there, the same sort of discernment is present in me as well.' At any time when a disciple of the noble ones is recollecting the conviction, virtue, learning, generosity, and discernment found both in himself and the devas, his mind is not overcome with passion, not overcome with aversion, not overcome with delusion. His mind heads straight, based on the [qualities of the] devas. And when the mind is headed straight, the disciple of the noble ones gains a sense of the goal, gains a sense of the Dhamma, gains joy connected with the Dhamma. In one who is joyful, rapture arises. In one who is rapturous, the body grows calm. One whose body is calmed experiences ease. In one at ease, the mind becomes concentrated." "Then it was not long before Brahma appeared. "When this was said, I said to him, 'Once, monk, some sea-faring merchants took a shore-sighting bird and set sail in their ship. When they could not see the shore, they released the shore-sighting bird. It flew to the east, south, west, north, straight up, and to all the intermediate points of the compass. If it saw the shore in any direction, it flew there. If it did not see the shore in any direction, it returned right back to the ship. In the same way, monk, having gone as far as the Brahma world in search of an answer to your question, you have come right back to my presence.'" Source: Prepared by jtb for Access to Insight. Reproduced and reformatted from Access to Insight edition © 2005 For free distribution. This work may be republished, reformatted, reprinted, and redistributed in any medium. It is the author's wish, however, that any such republication and redistribution be made available to the public on a free and unrestricted basis and that translations and other derivative works be clearly marked as such.